Chhurpi is a fermented dairy product prepared from cow milk. 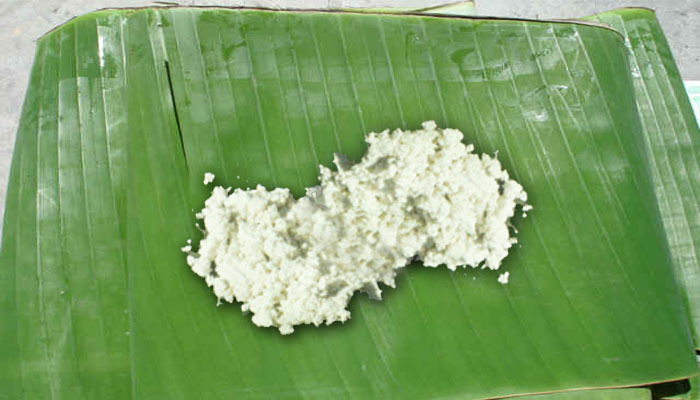 Chhurpi is a traditional cottage cheese which gives a texture of a white soft mass with mild sour taste. It is fermented by spp. of lactic acid bacteria. Preparation : Heat oil, fry Paanch phoran, add chopped onion till it becomes golden brown. Add finely sliced and grated ginger, tomatoes and seasoned with Chhurpi and add salt. Stir and fry till oil separates. Garnish with fresh coriander leaves. Serve hot with cooked rice. Preparation : Mix all ingredients, and serve as achar. The people of the Sikkim Himalayas eat many varieties of wild ferns commonly grown in these regions. Some of the common edible ferns are Diplazium polypodiodes locally called “sauney ningro”, iplazium spp. “kali ningro”, etc. Recipe of wild fern is unique in these regions which is mostly mixed with Chhurpi to taste. Ningro, an alpine fiddle-head fern and its tendrils when sauted with Churpi( form of cheese) makes an irresistible dish. Normally it is not served in the restaurants but is prepared as a household dish. Preparation : Heat oil and add Paanch phoran spice (a mixture of spices such as asafetida, dry coriander, cumin seeds, fenugreek, etc. ), fry chopped onion till it becomes golden brown, add chilies and turmeric powder. Fry finely cut pieces of Ningro and add a little amount of water, cook for 10 min. Seasoned Chhurpi and simmer briefly for 10-15 min. Curry is ready to serve with cooked rice. WOULD LIKE TO KNOW THE MANUFACTURERS OF CHURPI IN NEPAL OR SIKKIM .